← What is Twitter Etiquette for Follows? Telework is on the rise, there is no question. According to the Telework Research Network’s “2011 State of Telework Report”, there are 50 Million US workers who could and want to Telework. Experts at the intelligence and advisory service firm, International Data Corp., project there will be over 1.3 billion mobile workers in just two years, representing 37.2% of the global workforce. Because we are passionate about bringing telework and flexible work policies into the mainstream here at Duncan+Coleverria, we regularly conduct surveys on people’s experience with telework. Below are some interesting findings from our latest Telecommuting Survey, conducted in late 2012. Work at Home, Teleworking, Remote Working? What is it? For the purposes of this survey, we use “teleworker” referring to teleworkers, remote workers, virtual workers, and other professionals that work outside a traditional company office setting at least one day per week. 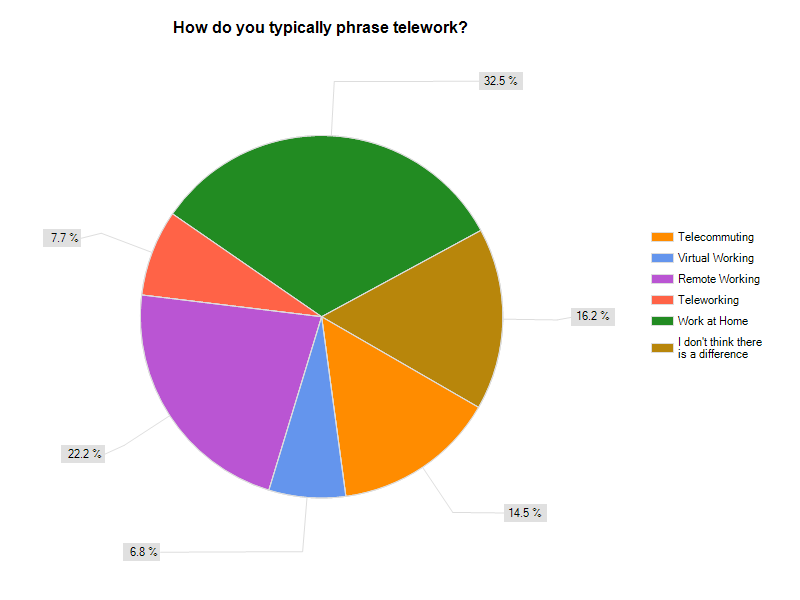 Of course we wanted to set the record straight on the correct term to use, so we asked teleworkers themselves as our first question: How do you typically phrase telework? Click on the graph below to see the responses. When we looked at different groups of users, we learned teleworkers (either business owners or employees) most often use the phrase “work at home” while managers of teleworkers use the term “telecommuting”. So all you folks who market to teleworkers….here you go, this one’s for you. Even with the absurdly biased question, the term “telework” hasn’t hit mainstream. We’ll keep surveying this question though, and shout from the rooftops when “telework” is the top answer. Where does one find teleworkers? Have you ever waited in line at Starbucks at 10:00 a.m. and had the thought “don’t you people work?” This begged the question: where do all the teleworkers work? Do they really set up shop in Starbucks or other places? 75% of teleworkers spend either all the time or most of the time in their home office. 65% said they rarely or never work in public places, such as Starbucks. Only 8% spend all our most of their time in a client office, though 39% sometimes spend time in their client offices. We think next time we will rephrase this question. Afterall, there are a lot of teleworkers (ahem, work-at-home workers) out there…so the 31% that say they “sometimes work” in public spaces could really be the folks that are filling up the tables at Starbucks during the day. Or perhaps these teleworkers just take long coffee breaks to check email, and call it work. Either way, next time we’ll get to the bottom of exactly how do teleworkers work in public spaces. Of course, since Duncan+Coleverria offers an online workspace we had to verify that people do in fact, have the need to meet online. Not surprising, 94% of the respondents of this online survey have the need to meet online with other colleagues, geographically distributed offices, or clients. What is surprising? With all the technology out there for online meetings, in 2012 the most used web-based service is good old fashioned email…used “most of the time” by 98.5% of teleworkers. The technology used most of the time is teleconferencing (56.3%) with VoIP technology is a distant second (34.9%) – thanks to Skype and GoToMeeting. Since we started taking this survey, physical distractions (household chores, television, kids) has repeatedly ranked as the biggest challenge when working at home, compared to other commonly cited challenges (internet distractions, feelings of isolation, and getting up and out to interact with others). In this survey, we wanted to find out just how challenging physical distractions are when working at home. We asked respondents to rank the challenge on a scale of 1-10. (10 = a huge challenge, 1 = not being a challenge at all. only 28% ranked it highly challenging (8-10). Despite being cited as on of the biggest challenges to working from home, it seems physical distractions are not all that challenging for those who work from home. Working from home is great, but what I miss most is [drumroll please]… other humans! While, on the whole, teleworkers love teleworking, 83% miss some aspect about working in a regular office environment. When asked what they miss most, the response was clear…. Despite the challenges with telework, and missing other people in the office environment, most are very happy with their telework experience, and rate their remote working experience an “8” or “9” out of 10. However, when asked if there was an opportunity to change the experience of working from home, 67% said they would explore other options, and 22% weren’t sure. Only 11% were satisfied enough with how they work from home. What was most interesting to us were the different points of view between teleworkers and those that manage teleworkers. Be sure to click “follow” on this blog so you don’t miss our next post. We will dig deeper into the survey results and see how teleworkers and their managers view things differently. DISCLAIMER: Duncan+Coleverria is not a research company. We fully understand calling this a survey is optimistic. Having taken a few statistics classes back in the day, we know enough to say that this survey isn’t exactly scientific: there could have been some bias in the questions, and it certainly wasn’t a terribly large sample size. Perhaps calling it a pulse check is more accurate, and certainly the feedback we received is interesting and worth sharing. There are many, many, research organizations who conduct formal surveys on telework and in no way do we mean to disrespect these amazing and incredible organizations who do focus on systematic, qualified research in this area. This entry was posted in General Musings and tagged business challenges, flipside workspace, remote worker, work from home, Work–life balance. Bookmark the permalink.